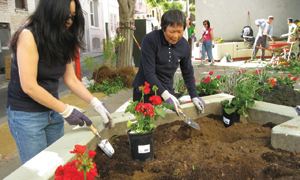 Buena Vista Neighborhood Association (BVNA) is one of the larger, more effective neighborhood organizations in San Francisco, with over 400 current Members. Founded in 1964, BVNA is a forum for neighbors to share information and ideas, and to advocate when needed on issues that affect our neighborhood. BVNA serves residents and property owners in the area generally bordered by Oak Street on the north; Divisadero/Castro Streets on the east; 16th Street, upper States, Levant, Lower Terrace and Saturn Streets to Roosevelt Way and 17th Street on the south; and Ashbury Street on the west. BVNA cooperates with and supports several more-local neighborhood groups within its overall area. About 80% of BVNA’s service area (and Buena Vista Park itself) are in S.F. Supervisor District 8 (Sup. Bevan Dufty), with the northern 20% of our area in District 5 (Sup. Ross Mirkarimi). Our neighborhood is served by S.F. Police Department’s Park Station. BVNA monitors legislation and advocates for our neighborhood at City Hall. BVNA does not endorse political candidates or most ballot propositions, nor does it usually take a position on individual property zoning matters, etc. BVNA Membership is open to all (property owners, renters and businesses) with an interest in Buena Vista Park and the surrounding neighborhoods. Visit the Buena Vista Neighborhood Association website. Donate to Buena Vista Neighborhood Association.